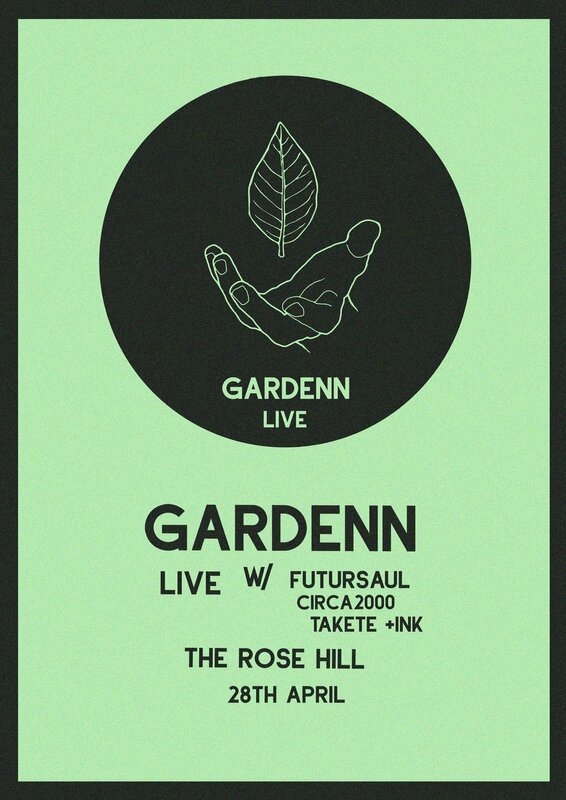 Brighton DJ collective Gardenn take on a new venture with Gardenn Live 001 - the first in a series of live electronic music nights at The Rose Hill. Headlining is Futursaul, a new collaboration from Vels Trio's Jack Stephenson-Oliver and Barney Whittaker, AKA Footshooter. Expect a dance-floor focused blend of jazz and broken beat from two of Brighton's most recent musical successes. Joining them on the line-up are Circa 2000, Takete and Ink. Futursaul is a new project featuring the combined noises of Jack Stephenson-Oliver (Vels Trio) & Barney Whittaker (Footshooter). The sound combines extra terrestrial synth-driven grooves with skippy beats and rhythms focussed firmly on the dancefloor. They will be bringing the project into the public sphere for the first time with this exclusive performance in Brighton. Circa 2000 comes to us fresh from a storming release on Computer Club - expect synth-laden new wave and crazy cosmic disco. Joined by Gabriel Davison for an immersive audio-visual experience. Here's what Bleep.com had to say - "Sheffield based Central Processing Unit drop a new LP on their Computer Club sub-label. The debut album from William Wiffen is a real homage to those early motorik records, arpeggios and sequenced rhythms aplenty. He glides through five tracks of Tangerine Dream/Cluster influenced electronics that also seem to draw from that Prins Thomas space disco sound (check ‘Fall All Over the Place’). Slow-mo horror disco a la Mort Garson’s Ataraxia also makes an appearance on ‘Into Outside’, albeit sounding way more contemporary and laying off the devil noises. Wiffen then closes the album by channelling the glitch sonics of Nuno Canavarro. Pretty solid first album to our ears!" A Brighton four piece drawing on a broad range of influences.Takete bring a semi improvised set of moody songs against a backdrop of ambient soundscapes, driven by a strong rhythmic focus. From the jet end of a squid, using a cello, cornet and loop machines, Ink create original compositions live on stage that change with each performance. Their music often allows the machines to take a large part in the improvisations, drawing synchronicity between the technology and the instruments.